SKU: STE-EHD5. Category: Fire Extinguishers. 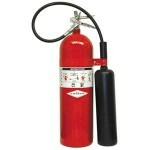 • Fluorescent Red fire extinguisher cover with elastic back and pull bottom tab for removal. • Now with added drain hole at base with brass grommet.